Viola "F1 Tumbola" is a new introduction and has been specially bred to have both a cascading and well branching habit. 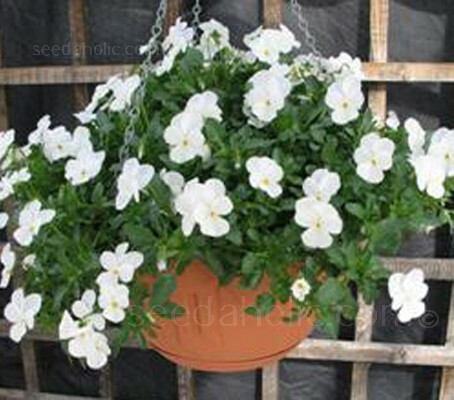 It produces a mass of ivory white blooms which soon fill a container. Violas serve a multitude of uses: as a groundcover under shrubs or larger perennials, in borders and rockery, in containers and tubs, but this cascading variety is certainly “the” Viola for hanging baskets! A very compact, small-leaved, plant that is exceptionally hardy and trouble free. If dead-headed regularly, it will flower from early spring into late autumn. Its flowering time is, quite simply, almost all year round. Sowing: Sow in late summer/autumn and late winter/late spring. Make a mixture of compost and approx 10% sand, to give a little drainage. Sieve the compost into pots or cell packs and press it down lightly. Add a little more compost if necessary. Make a small indentation with your finger and pop the seeds into it. Cover lightly with more sieved soil. The normal temperature of a fridge is 4°C (very useful!). Don’t put the seeds into the freezer, it will kill them. When seedlings have their first pair of true leaves and are large enough to handle, transplant into 7.5cm (3in) pots. Pot on year-old seedlings and grow on in well ventilated conditions for another year before planting outside permanently. Viola are best grown in a position with full sun to light shade. They are ideal for growing in the dappled shade of deciduous trees thus allowing full winter and spring sunshine. They like well-drained, fairly rich soil, so work in a spadeful or two of compost at planting time for best results. Plant the seedlings outside in spring, 10 to 20cm (4 to 8in) apart and water moderately until established. Viola love cool conditions, and although they don't need huge amounts of water they may need to receive extra moisture in dry weather. Violas have few pests and diseases, but in summer heat, Red Spider Mite is liable to attack if they are allowed to get parched. Spraying with a hose is helpful. Remove spent flowers to prolong the flowering season. If the plants are cut back after flowering they will flower again in late summer. Occasional feeding with liquid manure and even a top dressing of blood or bone is helpful for good blooms. Divide plants in the autumn or just after flowering. Larger divisions can be planted out direct into their permanent positions, though it is best to pot up smaller divisions and grow them on in light shade in a greenhouse or cold frame until they are established. Plant them out in the summer or the following spring. Cottage/Informal Garden, Flowers Borders and Beds, Alpine & Rockeries, Under-planting roses and shrubs, Containers, pots & hanging baskets. Flower arrangements. Edible Flowers. Violas can be slipped into almost any gaps where you need a little brightness. Choose appropriate colours to tuck around dwarf shrubs and conifers, hellebores and bergenias. They also make splendid companions for the shorter bulbs, create instantly colourful containers by choosing pots of dwarf tulips or small-flowered daffodils and match them with violas or pansies in just the right shades. The prolific blooms of violas and pansies offer a welcome splash of colour, but many gardeners don’t think of using them as cut flowers. These delicate flowers work best in small bottles and vases. And when you bring them into the warmth of your house you’ll notice, perhaps for the first time, their sweet fragrance. Violas are among the most popular edible flowers, and with good reason. All flowers are beautiful, but violas are easy to grow and are among the few flowers that actually taste good. Both the flowers and leaves in fresh and dried forms have been standard fare in Europe since before the 14th century. The simple addition of a few brilliant blooms transforms any dish into an elegant presentation. Fresh flowers are most often used for garnishing and crystallizing. Culinary uses include jams and jellies, teas, garnishes and salads. Candied violas are easy to make and look stunning atop cakes, ice cream, cookies, or other desserts. The pungent perfume of Viola odorata adds inimitable sweetness to desserts, fruit salads and teas while the mild pea flavour of most other viola varieties and species combines equally well with sweet or savory foods, like grilled meats and steamed vegetables. The heart-shaped leaves of the v. odorata provide a free source of greens throughout a long growing season. They add texture to green salads when young and tender. Later in the season, slightly tougher, older leaves are cooked with other potted herbs and greens in soups, stews and stir-fry’s. Viola is the largest genus in the family Violaceae, containing between 525 and 600 species. Violets are native to the temperate Northern Hemisphere and are also distributed in Hawaii, Australasia, and the Andes in South America. Violets are found in moist and slightly shaded conditions such as hedgerows. Viola cornuta are native to Spain and the Pyrenees mountains, and grow in temperate regions of the world. The low mounded plants have evergreen rosettes of heart-shaped leaves at the base and are often perennial in all but the coldest climates. The flowers come in all colours, may have contrasting lines of colour, and often a light scent. The shape of the petals defines many species, for example, some Violets have a spur at the end of each petal. Known for centuries, the ancient Greeks cultivated them about 500 BC or earlier. Both the Greeks and the Romans used Violets for all sorts of things such as herbal remedies, wine ('Vinum Violatum'), to sweeten food and for festivals. So popular is this group of flowers that it is under constant development by seed breeders. Many have the black central blotch, or 'face', that caused such a stir in sentimental Victorian hearts. Seed merchants also sell splendid single-colour varieties in blues, ambers, wonderful leather- reds, and even pitch black. The genus name Violet is the diminutive form of the Latin Viola, the Latin form of the Greek name Ione. There is a legend that when Jupiter changed his beloved Io into a white heifer for fear of Juno's jealousy, he caused these modest flowers to spring forth from the earth to be fitting food for her, and he gave them her name. Viola cornuta is commonly called the Horned Pansy or Horned Violet. The flowers have a characteristic long, thin, upward pointing nectar spur, from which the term 'horned' derives. Full sun to mostly shade. Late summer/autumn and late winter/late spring.